Providence Art Windows is pleased to announce that its next installation series will be on view from March 18 - June 11, 2010. The art and art installations presented in nine downtown windows are produced by Jean Cozzens, Susan Freda, Katy Foley & Anastasia Laurenzi, Jason Chakravarty, Ricky Gagnon, Kathy Hodge, Valerie Kim, Madolin Maxey and Howie Sneider. The spring installation series contains artists selected by the jury that reflect light, transition and transformation. Please join us for the opening reception, Thursday, March 18th, from 5-8 PM at The Gallery at Providence City Hall, 25 Dorrance Street, 2nd Floor., to meet the artists and go on a tour of the windows. Providence Art Windows is sharing an opening with She Works Hard for the Money curated by Rebecca Siemering, Director of Providence Art Windows and The Hive Archive in honor of Women’s History Month. The exhibition showcases work by 25 women who run Rhode Island nonprofit organizations and who also make art as a part or full-time practice beyond the working day. The exhibition will serve as an inspiring reminder that the vision to propel these organizations forward comes from the strong and creative presence within. The Gallery at City Hall is open during regular business hours, 8:30 am to 4:00 pm. If you are unable to join the reception, please download the map above, and take a tour of downtown Providence. 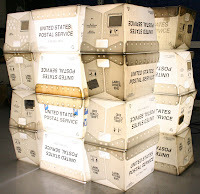 U.S. postal crates possess a simple yet complex shape. The angles allow them to be configured in many ways while maintaining the simple presence of a building block. The corrugated plastic has a quality that lends itself to illumination. This installation represents a familiar tool- a tool that is becoming less vital. With quicker and cheaper alternatives to bill paying and evasive substitutions to hand written letters (email, instant and text messaging), postal services are becoming obsolete as our relationships become automated. Based in Illinois and California, Jason Chakravarty creates mixed-media objects that explore questions of identity. Illumination is a key component of his work, most commonly in the form of neon, which for Chakravarty is the epitome of Americana. Materials such as glass, wood, metal, and found objects layer his work with narratives tracing the overlap between social, political, cultural, and personal identity. Straightforward imagery is collaged to create a recognizable vocabulary for investigating the search for individual identity among the perpetually proliferating brand-functions in the contemporary cultural landscape. To learn more about the artist, please go to jasonchakravarty.com. Have you ever seen the inside of your television? I do. I’ve been collecting discarded TVs since last summer, gleaned from the sidewalks of Providence. She loves trash and nature. Which is why she makes art. By combining industrial and natural materials with forms based from the world of nature, including those of the body, I am building hybrid organisms. These organisms are alive and flourishing, often invasively, as they grow salt crystals or channel water or electricity from their host. At times they become the record of a natural process, leaving behind delicate and ephemeral marks as a trace or memory of a life. My organism’s exhibit the duplicity of impermanence and resilience found in all biological life, from the great expanses of solar and ecological systems to the most minute and personal, the self. Susan Freda is a sculptor and jeweler working in RI. She received her BFA from The Rhode Island School of Design in 1996 and her MFA from the Massachusetts College of Art and Design in 2009. Inspired by the detritus of RI’s textile and jewelry industries, her work is informed by the intricacy, shine, and the handmade qualities of the products made here. 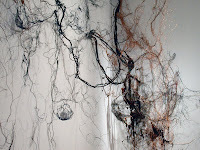 Susan's work often incorporates industrial materials that have been utilized to approximate natural and organic systems. Her work references nests, wings, vines, arteries, scales, and neurons, assuming a range of forms from dresses and shoes to hybrid incarnations of plant, mineral, and animal structures. Susan has been awarded a Pollock-Krasner Foundation Grant and an artist residency at the de Young Museum of San Francisco. Her work can be found in the collections of Fidelity Investments, Meditech, and Neiman Marcus, among others. Susan's shoe sculptures can be seen traveling with the Fuller Museum as well as with Craft Alliance of St. Louis, MO. Her wearable fashion pieces have recently been included on the runway in NY's Fashion Week 2010. ...like a Shadow of Time. The movement of time is observed through the seasonal shifting of light and shadow. 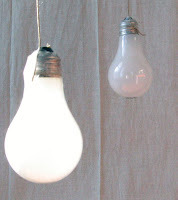 Light bulbs are the material vessel, stationed to register the order of the sun’s daily geometric path as light travels inside of, or projects through them. The field of bulbs within the window becomes a spatial registration of light and light’s memory of time. As the changes of time move through the field, new intervals of light and dark are revealed. Katy Foley is a recent 2009 graduate of the Landscape Architecture Master’s program at the Rhode Island School of Design. Her latest installation, Intervals of Perception, 2009 RISD, demonstrated the passing of the ephemeral qualities of light and weather as a spatial experience of continual present moments and the perceived ‘thickness’ of space. She also holds a Bachelor’s degree in Fine Art from the Maryland Institute College of Art where she made mixed media investigations of the movement of water over intervals of time. This work with time began with photographic explorations of Galway Bay while attending the Burren College of Art in Co. Clare Ireland. Anastasia Laurenzi is a recent 2009 graduate of the Architecture Master’s program at the Rhode Island School of Design as well as a graduate of the University of Memphis with a Bachelor’s degree in Fine Arts. Before attending RISD, her constructions were large-scale installations that dealt with the understanding of place using light (or the absence thereof). This led to a pursuit of understanding architecture and the way one moves through a space. Her most recent installation, at the Medicine Factory, explored the meaning of reflection and perception through the extension of light and anamorphic projection. Together, Anastasia and Katy are working toward progressing shared ideas of light and time in spatial construction, as well as a developing proposal for the Seekonk River draw bridge as an urban renewal site for Providence, RI. Howie Sneider’s work illustrates manufactured landscapes and historic sites. Throughout his time in Rhode Island he has explored and documented many of the state's parks and formerly used defenses of the Narragansett Bay. 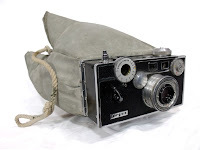 The sculptures represent that personal journey through their combination of body forms, vintage photographic equipment and military surplus fabrics. The interlocking shapes serve as a metaphor for the mechanization of our culture and an ever growing set of accessories with which to enhance our understanding of the world around us. In these pieces the camera literally has a body to process and internalize that which it sees, raising questions about the recording of memory and the sharing of experience. The photos were all taken in public parks maintained and preserved as historic sites. The images show the evolving state of our natural environment and some enduring monuments to the greatest mobilization of the 20th century. Howie Sneider was born in Syracuse, NY. His childhood exploration of the forests and abandoned quarries of central New York encouraged his sense of wonderment and discovery. He moved to Providence in 1998 and attended RISD where he studied sculpture and photography. He currently runs the Public Projects for the Steel Yard, a local non-profit organization specializing in the industrial arts. He has taught welding, fabricating, sculpture and drawing and has collaborated with over 100 other local artists to create functional and decorative public art throughout Southern New England. Special thanks to the RIDEM for their continued commitment ensuring access to and conserving our coastal resources and environment. It seems not until approaching the 19th century that artists have focused on individual churches as subject matter. Previously artists had achieved some of their finest work in the creation of the structure itself, attempting in their building to evoke the unknowable. To us their work sometimes exhibits a surreal quality, but to those living in that time, it had a profound emotional impact. Abbot Suger, the builder of the first Gothic church (St. Denis, 1144), stated his goal as striving to evoke “some strange region of the universe which neither exists entirely in the slime of the earth nor entirely in the purity of Heaven.” By the turn of last century, images such as Van Gogh’s Church at Auvers (1890), Robert Delaunay’s series of St. Severin (1909), and Canadian artist Emily Carr’s Indian Church (1929) show painters with a strong attraction to the image of the church. This series of churches depicts real churches but are not realistic renderings. The placement and the repetition of shapes interweaves a tight structure into the picture. In order to add a visual weight and a sense of the past I have surrounded these images with ornate but worn antique frames which lend to the paintings the preciousness of icons. I have hung these paintings on raw canvas to give an impression of quiet, shelter and protection. Below are the detritus of our existence, a by-product of the life force that ties us to this earth while also compelling us to look beyond our physical world. Kathy Hodge has been a painter working in the Providence area for the last 30 years. 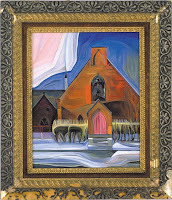 This series of paintings was completed in 1999 and can be seen on her website, along with other series, at www.kathyhodge.com. six-layer silkscreen print, color stages. The "Reconstructing Providence" poster was created in 2004 for a radio documentary made by Robin Amer. 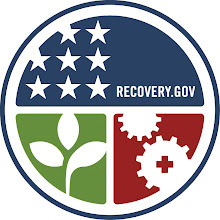 [http://robinamer.com/]. In silkscreen printing, each flat color is laid down in a separate layer, so an image with depth and complexity can be built up from what are really just simple stencils. While I was printing this poster, I set aside one sheet of paper after each color was printed, preserving a record of the six layers of ink that were necessary to create the image -- including one gradient roll for the sky, to allow it to go from light to darker blue. two-layer silkscreen print, five different colorway versions. I first drew this building in the summer of 2002 (sitting on the steps of the downtown post office and, over a couple of weeks, becoming pals with the security guard there). In 2009, I re-adapted that drawing into a simple portrait of everyone's favorite "Superman" skyscraper, which was originally named the "Industrial Trust Building" (built, of course, by the Industrial Trust Company!). I wanted to try out different relationships between colors as well as creating prints that would evoke different atmospheres, lights, or times of day. Over the course of printing, I changed the colors of ink in the screen to create five different "colorways": versions of the same image made with different colors. Jean Cozzens is an artist, designer, screenprinter, carpenter, and teacher. He has lived in Providence since 1999 (spending time also in Italy, Worcester MA, Philadelphia, and New Orleans). He received a bachelors' degree in architecture from RISD in 2005. Since then, he has collaborated on participatory cardboard city-building projects, mentored high school students in screenprinting and artmaking, organized the renovation of a kitchen in a collective house, and made tons and tons of drawings, prints, and posters. He will be teaching advanced screenprinting classes this spring & summer, at community print shops in New Orleans and in Providence. He thinks constantly about cities, buildings, and spaces, as well as graphics, light, and patterns. On his own, he works meticulously by hand on drawing, building, and printing; in collaboration, he strives to work in ways that allow knowledge to be shared and to grow. As a 50-something person I have had my fair share of life's ups and downs just like most people, however I always try to remain grateful for the good things I have in my life on a daily basis. That is why I create my art every day because it transports me to a place of total happiness which I express using my very active imagination, my sense of humor, my love of color and my eclectic mix of bric-a-brac. 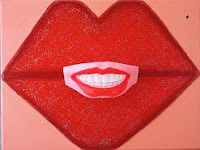 Have you smiled today? I hope you have now. This body of work has evolved over the last two years and consists of paintings and charcoal drawings of treasured objects from my home. Predominantly they are black iron teapots juxtapositioned with a clay horse whistle, shells, and other small objects. I went back to basic charcoal drawing for most of 2008, exploring only the black teapots. These drawings are on corrugated cardboard and are, for the most part, 4’ x 4’. 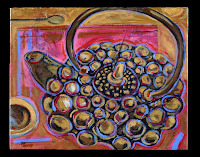 I explored every angle, shine, and texture of these teapots, and by 2009 I was ready to render them in paint. My desire is to not reveal their size or location but place them in ambiguous spaces and relationships. Often as the paintings evolved, the objects seem to tell their own stories of winter nights, gossip, sea scenes, or summer gatherings. Or maybe that is all in my mind and now it is time for others to come and interpret these paintings. Colors and shapes lead the eye in a vigorous dance around her canvases. At first glance, her paintings seem to depict familiar landscapes and actual locations, yet they are only loosely based on reality. Madolin paints from memory, challenging the conventions of the medium with poetic grace and playful energy, Her emotional reactions to a place or an experience become a story told through color and line. Madolin Maxey is a graduate of the Maryland Institute College of Art and the Rhode Island School of Design. A Providence resident since 1982, she has been a member of the Providence Art Club since 1996. Although primarily a painter, she has built teahouses, designed extensively for theatre, and initiated public art projects in Providence. She maintains a studio in Providence, and can also be contacted through the Providence Art Club.